Japan has a long history of onsen (hot spring) bathing. The best way to immerse yourself in the bathing culture is to visit an onsen ryokan, a traditional Japanese inn with hot spring baths on the premises. Many of these ryokan also serve kaiseki, Japanese multi-course haute cuisine, which is eaten in your own private dining room. Bathe, eat, sleep and repeat - it doesn't get much better than that. 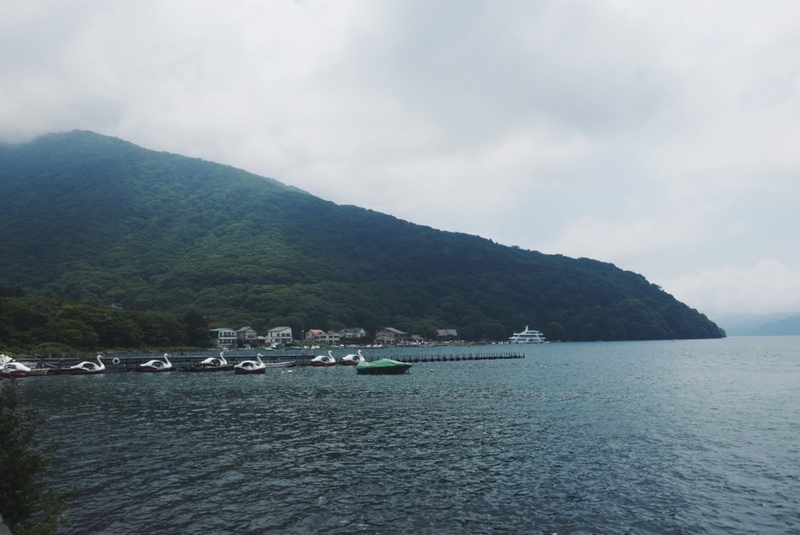 To celebrate our collective birthdays, David and I ventured south to Hakone, an onsen resort town near Mt. Fuji, reachable in 90 minutes by train from Tokyo. Our home for the weekend was Kinnotake, a 10-room luxury ryokan that puts a contemporary spin on the traditional Japanese inn. To make foreign guests more comfortable, Kinnotake has Western beds and an onsite bar that features a full wine cellar. But this ryokan's design, food and service are not like anything you'll find outside of Japan. When I booked our reservation at Kinnotake, I was asked what time we planned to arrive for check-in. Without much thought I selected the earliest check-in time - 3 p.m. - assuming that they only needed a window. I realized my error when we arrived at the property around 3:45 p.m. to find a Kinnotake employee waiting for us out on the street. Despite the fact that he had obviously been standing there for quite some time, he energetically greeted us by name and ushered us inside. Entering through the front door of Kinnotake felt like walking into another world. The floor of the dimly lit, bamboo-lined entranceway was glistening with water as if it had just rained inside; the air was marked by the faint scent of coconut incense burning. I was giddy with anticipation to see our room. Each of the suites at Kinnotake has a private onsen bath and tatami (mat) room where meals are served. Guests are provided with yukata (casual kimono) and zori (Japanese sandals) to wear around the property - we didn't change back into our own clothes until check-out. We spent the afternoon relaxing on our terrace and taking quick dips in the onsen (the oppressive July heat was hardly conducive to a long, leisurely bathing experience). The mineral-rich water left your skin and hair so soft that I barely felt the need to breakout my arsenal of skincare and haircare products. The suites also come with a personal attendant; luckily ours spoke English. Before each of our scheduled meal times, he would phone the room to make sure that we were ready to be served. Minutes later there would be a soft knock at our door, where the attendant would be kneeling with the first course. Dinner was by and large the highlight of our stay at Kinnotake - in fact, it was the best meal we've had thus far in Japan. Nine courses in total, our first kaiseki experience did not disappoint. There was sashimi with salt mousse, soshu beef topped with sea urchin, whole roasted sweet fish, miso-infused duck - all of it almost too beautiful to eat. The attendant would explain each course in detail before quietly slipping out; instinctively reappearing with the next course as soon as we were finished. Kinnotake was designed for the dark, which is most apparent in the property's defining a feature: a large pond that perfectly reflects the sky and surrounding bamboo forest at night. We wandered down to the onsite bar after dinner to sit on the patio overlooking the pond. You might find excuses to keep drinking here as this bar begs for lingering - it is a postcard for contemporary Japanese design. Surrounded by tube-like walls lined with bamboo, you can perch on woven mats that appear suspended above a glass floor displaying smooth river rocks below. The following morning we were served an equally indulgent Western-style breakfast (I'll admit to stuffing a couple tiny jars of Kinnotake's homemade jam into my suitcase). David and I were both remiss to remove our yukata and change back into our street clothes, but we left the ryokan in a state of relaxed bliss. Although our tattoos mean that we'll never be able to visit a public onsen, I don't so much mind being restricted to the private hot springs - especially if it means returning to Kinnotake. Ride the old-fashioned Hakone Tozan Railway, the only mountain railway in Japan. The train slowly climbs up the steep hills using switchbacks. Summer hydrangeas line the railway making for a beautiful ride. Take in an impressive collection of 19th- and 20th-century Japanese and Western sculptures as you meander through a green mountainside at the Hakone Open-Air Museum. Don't miss the Picasso Pavillon. There are several cafes on site, as well as an artful children's playground and hot-spring foot bath. Hop aboard a kitschy pirate ship on the Hakone Sightseeing Cruise for a 40-minute tour of gorgeous Lake Ashi. The pleasure boats travel between three different ports tucked between miles of unspoiled shoreline. Wander the moss-covered stone pathways leading to the Hakone-Jinja Shrine, hidden in a dense cedar forest. Marvel at the enormous lakefront torii gate that marks it location. Check out the souvenir shops in Moto-Hakone offering a variety of Yosegi (wood mosaic) products. The beautiful craftwork is available for purchase in the form of boxes, trays, tableware, pens, fans - you name it. From Tokyo, the Odakyu line will take you directly to Hakone-Yumoto Station (the region's transit hub) from Shinjuku Station via a relaxing 90-minute ride on their 'RomanceCar' train. You'll also need to pick up the Hakone Freepass, which provides unlimited use of the many modes of transport within Hakone - as well as discounts on admission fees at area attractions. Be sure to make use of the luggage forwarding service available at Hakone-Yumoto station! Arrive before noon, drop your bags with the forwarding service for a small fee and your luggage will be waiting at your accommodation by 3 p.m. This travel guide is available as a GPS-enabled map with offline navigation. Click here to download the guide and receive turn-by-turn walking directions between sights - no data plan or WIFI required! Hydrangeas along the Hakone Tozan Train line. The Hakone Open Air Museum. 'The Pleureuse' by Francois and Claude Lalanne-Xavier. The 'Garden of Stars' maze. Donning a yukata (left side always folds over right side!). Our private terrace and onsen. View of Kinnotake's reflection pond from our suite. Three kinds of seasonal sashimi with salt mousse and tosa soy sauce. Soshu black beef with sea urchin and fushimi pepper. Roasted sweet fish and tomato. Vanilla and blueberry ice cream with figs and jelly. Seating at Kinnotake's Bar Bamboo. Our vessel for the Hakone Sightseeing Cruise. The moss-covered path to the Hakone-Jinja Shrine. The Hakone Shrine's lakefront torii. Cherry blossom flavored ice cream. Yosegi-Zaiku products on display at the souvenir shops. I couldn't resist leaving without this tea set. Cooling our toes after a long afternoon of wandering.